Wahoo! It’s Cake Week! I love these collaborative cooking weeks. I get borderline giddy with anticipation to see what my friends will be making. Those girls never fail to impress. For my contribution to Cake Week, I chose the ice cream cake category. Why? Because I like to shake things up, and because I promised myself that I would keep trying new things as my carry-over mantra from 2011. Hence, I give you my very first ice cream cake. Or cakes. I made them individual serving size, and here’s how it all went down. 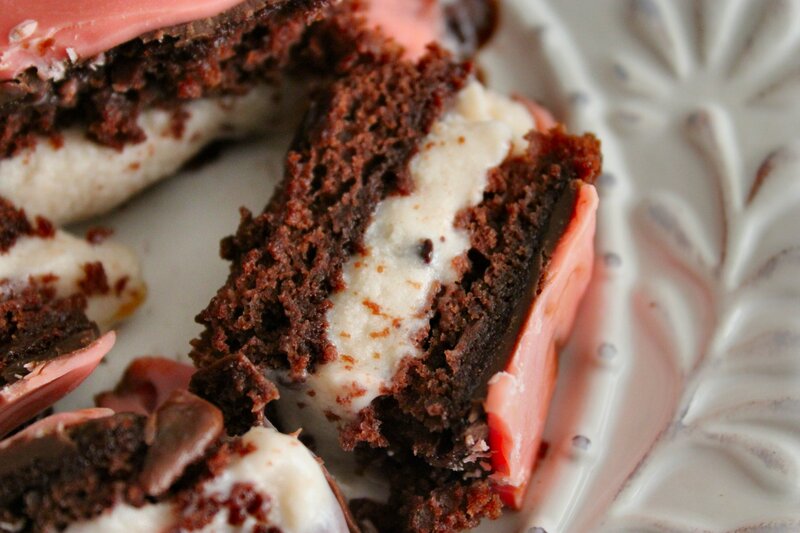 Ice cream wrapped in a chocolate cake hug & smothered in more chocolate. 1. Starting with a dark chocolate fudge cake mix (yes, a cake mix), I mixed it according to the package directions except for one small thing. I substituted 1/4 cup of Hershey’s Special Dark chocolate syrup for 1/4 cup of the water. Because nothing compliments chocolate like more chocolate. 2. I covered a sheet cake pan with parchment paper and spread the cake batter in a thin layer (about 1/4″). That sounds thin, but the batter puffs to about 1/2″ when it’s done. I baked it at 350F until the cake was slightly springy to the touch and a toothpick came out clean. Once out of the oven, I let it cool to room temperature, then slid the entire sheet pan into the freezer for at least one hour so the cake would be firm enough to cut without falling apart. 3. 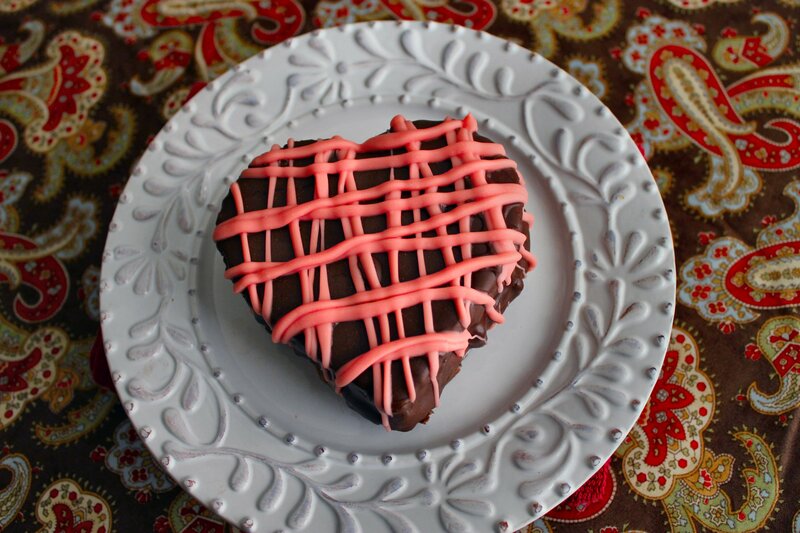 Using a heart-shaped cookie cutter, I cut the cake into 8 hearts (each about 4″ wide) and placed them back in the freezer while I prepared the ice cream. Note: to make 4 individual-size ice cream cakes, you’ll need 8 cake cutouts and 4 ice cream cutouts in whichever shape you choose. 4. For the ice cream layer, I selected a pint of Ben & Jerry’s Cherry Garcia frozen yogurt and a pint of Ben & Jerry’s Strawberry Cheesecake ice cream. I softened both in the microwave for 30-40 seconds, stirred to loosen them up, then poured each pint into a parchment-lined pan. I spread the ice cream into a 1/2″ thick layer and placed both pans back into the freezer to firm up. I 'heart' cake and ice cream. 5. Once the ice cream was firm, I used the same cookie cutter to cut the ice cream into heart shapes. 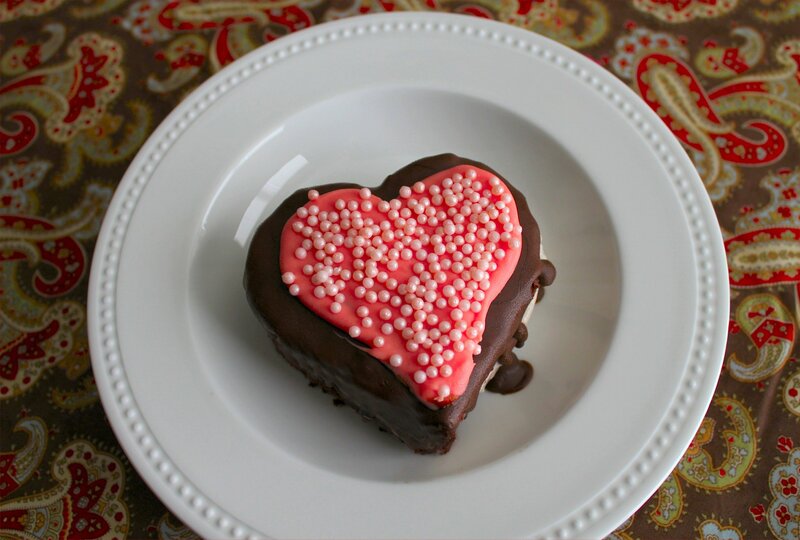 I then stacked an ice cream slice onto 4 hearts and topped them with another cake heart. I pressed ever so lightly to set the layers together, but not so hard as to cause the ice cream to squish out. I popped it all back into the freezer to firm up again. As you can see, these take very little work, but a bit of time as each stage goes back into the freezer to set up. 6. Once the ice cream cakes were good and cold, I removed them one at a time and covered them in Magic Shell. Ever used Magic Shell? It’s liquid chocolate in a bottle that sets up into a hard chocolate shell when it hits cold ice cream and it makes a lovely, smooth coating for ice cream cakes. Again, they go back into the freezer for 10 minutes, or until the Magic Shell is firm. 7. To decorate, I melted pink candy melts over a double boiler, then scraped it into a baggie, snipped off the corner of the bag, and quickly piped decorative touches on the cakes. Some got crisscrossed hash marks (as seen above) and some got piped pink hearts. The hearts got a liberal sprinkling of pink nonpareils because they look so pretty. And what girl doesn’t love pastel nonpareils? Pink candy melts and nonpareils make everything prettier. 8. Once they’re done, store your ice cream cakes in an air-tight container in your freezer. To serve, simply plate about 5 minutes before serving. Well, I say 5 minutes because I live in Houston and it’s always warm down here. If you live in a colder climate, set them out about 10 minutes before serving. The great thing about this simple version of ice cream cake is that it’s limited only by your imagination and the selection of cake mixes and ice cream sold at your neighborhood store. Pick your favorite ice cream, then pair it with a complimentary cake mix, and you’ll be off to the races. Strawberry cake with banana split ice cream? Why not? Fudge cake with coffee ice cream? Sounds divine! Butter cake with pecan praline? When should I come over? Now go forth and bake, my minions. Bake and slather cake layers in ice cream. You’ll be surprised at how easy these are to make. Now for the really fun part. Kirsten, our fearless leader, is celebrating Cake Week with a linky party. If you have a favorite cake recipe you’ve blogged about, click here to link up and join the fun. If you’re more of a cake lover than cake blogger, drop by! It’s a great way to add new recipes to your repertoire. Just click any link photo to open the blog page and view the recipe. It’s like finding a collection of cake recipe cards, but more fun and with better photos! Now if you’ll excuse me, this girl’s got a date with an ice cream cake. If you need me, I'll be hiding in a closet so I don't have to share. Sorry, honey.